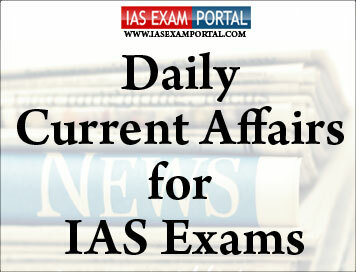 Current Affairs for IAS Exams - 10 October 2018 | IAS EXAM PORTAL - India's Largest Community for UPSC Exam Aspirants. Prime Minister Narendra Modi on Tuesday said his government had fulfilled the long-pending demand of farmers by considerably increasing the Minimum Support Price of around two dozen crops recently and was working towards ensuring 50% profit for them over input cost. Mr. Modi was speaking at a public meeting in Garhi-Sampla here to unveil the 64-foot-tall statue of Jat leader Sir Chhotu Ram, a prominent politician in British India’s Punjab Province credited with working for the uplift of the farming community. Mr. Modi also laid the foundation stone of a rail coach refurbishment factory to be set up in Sonepat. Mr. Modi said his government had also worked for the welfare of the farmers like Sir Chhotu Ram and ensured the right price for their produce, protection against crop damage, adequate supply of fertilizers and good health for the soil. The Prime Minister said efforts were on to supply irrigation water to places where it had not reached for the past 30-40 years. Mr. Modi said a scheme was also initiated to compensate the farmers who had failed to get the MSP for their crops. Ayushman Bharat, a healthcare scheme, he said, was also introduced so that the farmers do not end up spending their income on hospital bills. He said that in less than two weeks’ time since the scheme was initiated, more than 50,000 people had availed its benefit. Several coastal districts of Odisha have been put on high alert as the cyclonic storm ‘Titli’ is expected to intensify into a severe cyclonic storm in the next 24 hours. As a precautionary measure, the State government has ordered the closure of all educational institutes and anganwadi kendras in Ganjam, Gajapati, Puri and Jagatsinghpur districts from Wednesday till effects of the storm are over. A decision over closure of institutes in some other districts may be taken after a review of the situation on Wednesday. The latest bulletin by the India Meteorological Department said the cyclonic storm was centred at 510 km from Gopalpur. This severe cyclonic storm is expected to move west-northward and make landfall between Gopalpur in south Odisha and Kalingapatnam in Andhra Pradesh by October 11 morning. During the landfall, this severe cyclonic storm is expected to have a wind speed of 100 to 110 km/hr with gusts of up to 125 km/hr. The deep depression over the westcentral Bay of Bengal moved west-northwestwards with a speed of about 8 kmph and intensified into a cyclonic storm and lay centered about 530 km southeast of Gopalpur (Odisha) and 480 km east-southeast of Kalingapatnam (Andhra Pradesh). Thereafter, it is very likely to re-curve northeastwards, move towards the Gangetic West Bengal across coastal Odisha and weaken gradually. Heavy rain is likely to occur at isolated places over coastal Odisha and north coastal Andhra Pradesh in the next 24 hours. According to the IMD, gale and wind speed reaching up to 40-50 kmph and gusting touching 65 kmph is likely to commence along and off north Andhra Pradesh, Odisha and West Bengal coasts from Tuesday night. The Union Cabinet chaired by the Prime Minister Shri Narendra Modi has approved the merger of the existing regulatory institutions in the skills space - National Council for Vocational Training (NCVT) and the National Skill Development Agency (NSDA) into the National Council for Vocational Education and Training (NCVET). NCVET will regulate the functioning of entities engaged in vocational education and training, both long-term and short-term and establish minimum standards for the functioning of such entities. The Council would be headed by a Chairperson and will have Executive and Non-Executive Members. Since NCVET is proposed to be set up through merger of two existing bodies, the existing infrastructure and resources will be utilized for the most part. This institutional reform will lead to improvement in quality and market relevance of skill development programs lending credibility to vocational education and training encouraging greater private investment and employer participation in the skills space. This in turn will help achieve the twin objectives of enhancing aspirational value of vocational education and of increasing skilled manpower furthering the Prime Minister's agenda of making India the skill capital of the world. Being a regulator of India's skill ecosystem, NCVET will have a positive impact on each individual who is a part of vocational education and training in the country. The idea of skill-based education will be seen in a more inspirational manner which would further encourage students to apply for skill-based educational courses. Pedestrians and cyclists suffered the biggest spike in fatalities in road accidents across the country in 2017, even as overall fatalities in road accidents and the total count of such incidents declined marginally. According to the Ministry of Road Transport and Highways’ annual report on road accidents, the total number of accidents dropped 3.3% in 2017 to 4.64 lakh, with the overall number of lives lost in these crashes declining 1.9% to 1.47 lakh, from 1.5 lakh in 2016. However, the number of pedestrians killed in road accidents jumped by 29.9% to 20,457 and the number of cyclists killed surged by 37.7% to 3,559. Pedestrians and cyclists together accounted for 16.2% of the total fatalities in road accidents during 2017. The data also shows that almost 7 out of 10 two-wheeler and four wheeler users who died in an accident did not follow the mandatory requirement of wearing helmets and seat belts. Tamil Nadu topped in number of accidents, while U.P. had the most fatalities. The Union Cabinet, chaired by the Prime Minister Shri Narendra Modihas approved Memorandum of Cooperation between India and Finland on Environmental Cooperation. The concerns of rising environmental issues are not limited to any country but pose a serious challenge to the entire Globe. India is one of the emerging economies in the world with vast coastline and rich bio-diversity. Finland's main environmental issues are air and water pollution, and the preservation of its wildlife. Finland's principal environmental agency is the Ministry of the Environment, established in 1983. Industrial pollutants from within the country and surrounding countries affect the purity of both the nation's air and water supplies. It also faces challenges like water pollution and increased demand for natural resources. Both the Countries face many environmental challenges like waste water management, conservation of threatened species, control of air and water pollution and increased demand for natural resources.